attorney for a two-year term (may be extended, subject to funding) to build, file, and litigate complex civil actions in state and federal court to protect and preserve civil liberties for all Washingtonians. This new attorney position will give us the capacity to push forward our affirmative agenda as well as engage in fast-moving, defensive battles against the current administration’s policies. communities to protect and extend American rights to freedom, fairness and equality. The ACLU is both nonprofit and nonpartisan. against ICE and the Border Patrol, the first lawsuit in the country about the right to medication assisted opioid treatment for people in jail, and a suit against the state for failing to prevent the disproportionate discipline of children with special education needs. The ACLU stands for the principle that every individual’s rights must be protected equally under the law, regardless of race, religion, gender, sexual orientation, age, disability or national origin. 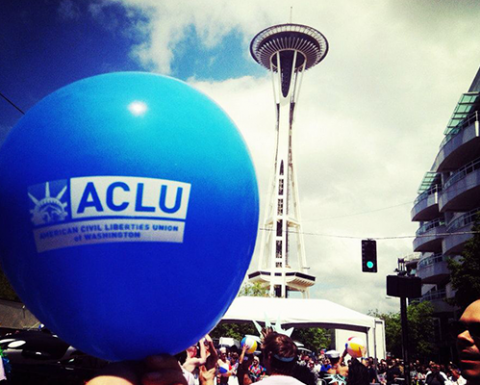 The ACLU-WA’s staff of 40+ employees and numerous volunteers work in a fast-paced, friendly and professional office in downtown Seattle. We are supported by more than 75,000 members, activists, and donors. inclusive culture. The ACLU encourages applications from all qualified individuals without regard to race, color, religion, gender, sexual orientation, gender identity or expression, age, national origin, marital status, citizenship, disability, and veteran status. practice, and handling trials and appeals. typically with assistance from outside cooperating attorneys, as well as helping to supervise and mentor more junior attorneys in the department. employees, the staff attorney is expected to help maintain a positive, respectful, welcoming, and professional work environment for employees and volunteers. At least four years of significant litigation experience, with some demonstrated ability to develop and litigate class actions and/or civil rights cases. Applicants with far more than five years of experience are strongly encouraged to apply. Plaintiffs’ side work and/or previous experience in constitutional law litigation is a plus, as is experience supervising other attorneys. Must have a commitment to race equity, and a personal approach that values the individual and respects differences of race, ethnicity, age, gender, sexual orientation, religion, ability and socio-economic circumstance. retirement plan, and an ORCA card. To apply, email a letter of application and resume to [email protected] and include in the subject line of the email: your last name and Staff Attorney. In your letter, please indicate where you learned of the posting. Applications will be accepted until the position is filled, at which time the job announcement will be removed from our website at www.acluwa.org/owa. Foundation. The two corporations share the same overall mission, office space, and employees.